I don’t always crave heavy meat and potato meals like this one but recently I picked up a package of short ribs from Costco and wanted to treat my husband with something a little different than what we usually have for dinner. He loves short ribs and it’s something he would typically order out. 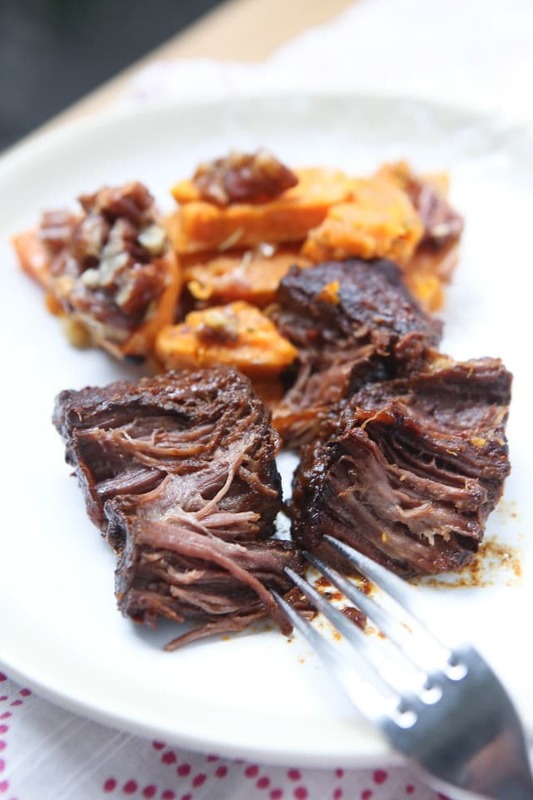 My friend Julie has posted some pretty amazing looking short rib recipes over the years and I’ve always wanted to try making them myself. 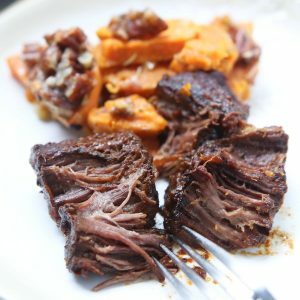 These Slow Cooker Barbecue Short Ribs turned out absolutely amazing – I was pretty proud of myself considering how inexperienced I am with cooking cuts of beef like this. 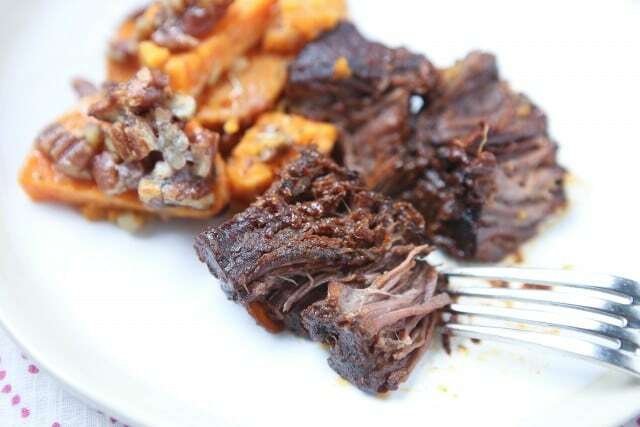 Let’s be honest though, it’s hard to mess up tender beef like short ribs in the slow cooker. I quickly browned the short ribs before setting them to cook in the slow cooker for several hours. If you are in the market for a new slow cooker I highly recommend this Crock-Pot Slow Cooker with Stovetop Browning, I’ve been using it for the past year and it has been so awesome to skip the whole brown in a skillet step when it comes to slow cooker recipes!! Seriously, a game changer. Love it. The short ribs turned out super tender (as I expected) and the flavor was on point. This felt like such a fancy meal, though total comfort food! I served it with this Savory Sweet Potato Gratin but they would be delicious over creamy mashed potatoes. You’ll have to let me know your favorite way to cook short ribs for next time I get the craving to make them. Season short ribs with salt and pepper. Place a couple of short ribs in a skillet over medium high heat. Sear for a minute on each side, until browned. Set aside and continue with rest of short ribs. 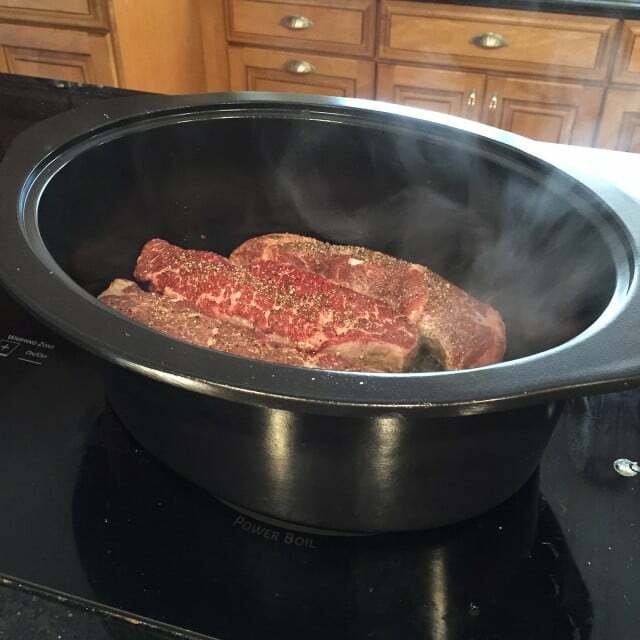 Place browned short ribs into slow cooker. Combine barbecue sauce, maple syrup and soy sauce in a small bowl and pour over short ribs. Cook on low for 8-10 hours. Serve with mashed potatoes or this Savory Sweet Potato Gratin. Follow Aggie’s Kitchen’s board Slow Cooker Goodness on Pinterest. Short ribs are definitely game changers!! I am positively drooling over these! The ribs came out delicious but I would have liked a thicker sauce. Ant suggestions for that? Hi! Glad you liked the ribs! For a thicker sauce I would pour the sauce from the crockpot into a small saucepan and reduce the sauce over a low heat until it thickens.